50 Fish Species of North America: The A to Z of Local Fish #Infographic ~ Visualistan '+g+"
Who wants to go fishing? This extensive and comprehensive list from Alan's Factory Outlet looks at several different kinds of fish from all across North America, from the humble catfish to the rare golden trout to the beautiful giant oarfish. The giant oarfish certainly lives up to its name, too. Did you know that it can grow to be an astonishing 36 feet long? The freshwater fish of North America can be so different, so it's very important to keep the locations in mind as well. You would have a much better idea of what you've caught if you determine what the local species in Alaska are in comparison to places like Lake Michigan or Florida. You can learn quite a bit about all of the different fish species across North America with this very helpful list from AlansFactoryOutlet.com! 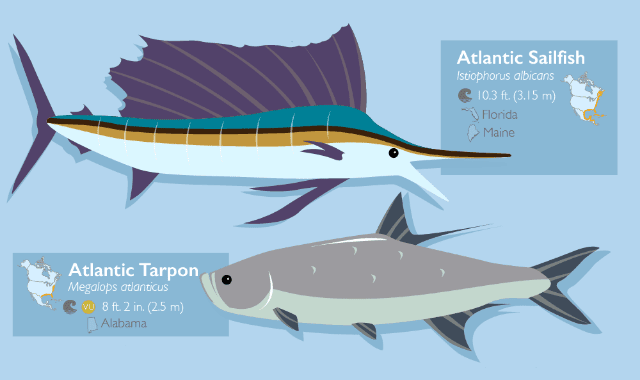 So, take a look at this comprehensive infographic and then grab your fishing pole, have some fun, and learn more than ever about these 50 fish species from all across North America!